Geary Pacific Employees can choose from a catalog of 200 courses related to products and customer service. 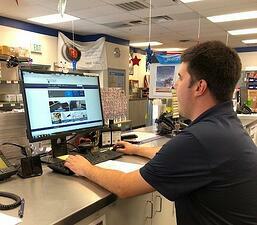 Portland, Ore. – August 2, 2018 – Geary Pacific Corporation, a distributor of Bard heating and air conditioning equipment, parts and service, belonged to an industry purchasing cooperative that offered online learning to its members. Success with the coop’s online product courses developed by manufacturers led Geary Pacific to invest in a learning management system (LMS) exclusively for Geary Pacific. Kelley’s LMS, made by BlueVolt, has 272 users who take, on average, nearly 12 courses from a catalogue of more than 200 ranging from tutorials on new products to handling customers. John Leh, CEO and lead analyst for Talented Learning, LLC, an advisory and research firm focused on training and development, has spent 25 years as both a sales manager and a researcher. He’s advised hundreds of companies over the years on how to create a culture of learning. “From a training perspective, if you help distributors with the belly-to-belly sales, they will get more volume and a broader kind of sale because of what they learned about the products and service,” Leh says. By having a more structured training regimen, Geary Pacific says it has found turnover decreased and employees happier. Kelley measures that with a system of performance reviews wherein he asks employees to: give feedback on their performance; tell him what Geary Pacific is doing well, and outline short- and long-term goals. What he’s heard, especially among the company’s 20-somethings, is that employees want to learn more about the industry and grow with the company. The move from sharing an LMS with a cooperative to implementing something uniquely its own has helped Geary Pacific formalize a training program and improve reporting. According to Kelley, having his own system means Geary Pacific can create career paths tailored to a variety of disciplines. “If an employee wants to grow with our company and she has, for example, more of a sales mentality, then we can put her on a track for sales management,” says Kelley. Kelley sees his job as transforming training from a cost center to a strategic asset. And his learning culture is underpinned by technology that helps him identify employee goals, catalogue his investment in learning and measure the outcome. Leh believes it is easier today to gauge the effectiveness of training by using training technology and CRMs to extract data and make a correlation between the people a company certifies on certain products and how much these same employees (or branches) sell.